In this new segment I will look at some of the key tactical detail from the weekend’s Premier League action. City lined up in their familiar 4222 system and played very narrowly as a result. As a result they played fairly slowly and mostly in front of a West Ham side which was selected primarily to contain City despite there being little riding on the game. Man City completed 485 passes, 92 of which were played by Yaya Toure. In fact, Yaya dominated the game for City but other than one burst which resulted in a goal he was happy to get the ball and move it on. Considering his renown for lung busting runs through the middle of the pitch he actually only attempted 3 all game. He received the ball from his team mates 95 times, all over the pitch, but on pretty much every occasion he shifted the ball on to a team mate. Yaya’s ability to get around the entire pitch to make himself available to receive the ball can be seen on the left and his overwhelming influence can be seen on the right. We can also see how deep and narrow City became by the amount of time the ball spent in the middle of the field with only Samir Nasri providing any attacking width. The full backs were also unusually restrained because of the defensive discipline of West Ham’s wingers Matt Jarvis and Ricardo Vaz Te. Zabaleta in particular was more preoccupied with his defensive duties against an improved Jarvis. There is a clear shortage of his usual trademark runs forward and the total lack of touches between the edge of the box and the touchline is very unusual for him. On the other side Clichy got forward a lot but most of his passes in dangerous areas are backwards because he was getting in to crossing position and there be no one in the box, rather a ring of Aguero, Tevez, Silva and Nasri around the edge looking for a pass to feet. This pattern meant City kept getting up to the West Ham box on the left before having to work their way back out again. This slower tempo has been a problem for them all season and it’s telling that the moment of quick football that they played saw them scythe through West Ham for Aguero’s opening goal with a succession of quick passes in the box between Nasri and Silva. Newcastle got this all wrong with the team selection. Alan Pardew chose to play a 4231 system with a midfield of Perch, Tiote; Sissoko, Cabaye, Jonas. It certainly has a lot of industry and strength which presumably Pardew wanted in order to overcome the tricky attacking trio that Liverpool fielded. However, it was completely unbalanced. Cabaye is not a number 10. He doesn’t have the speed of foot or thought to play so high up the field. He is a top class deep lying midfielder because he has a good range of passing and also makes tackles and interceptions. He is a key organiser deep in the midfield as he can start attacks for Newcastle and stop them from the opposition. Playing deeper also compensates for his lack of creativity. He is an excellent technician but his passing game is too simple to play at 10. Both of these are playing the exact same role for their team but look how differently they played it. Cabaye isn’t playing the position that Pardew deployed him to. If you ignore the corners that he took he only completed one pass in to the penalty box compared to Coutinho’s six. Coutinho also held his position much better than Cabaye. The young Brazilian remained central, allowing him an easier connection with an unusually disciplined Daniel Sturridge who thrived up front. Cabaye is roaming all over the pitch but what he did most was drop back in to his usual position. If you look at the area around the D of the Liverpool penalty box he didn’t have any involvement. It meant that Newcastle posed no attacking threat. A comparison of Newcastle and Liverpool’s final third passing shows the difference in approach further. Newcastle started their attacks from much deeper than Liverpool. This was for a couple of reasons. The afore mentioned tactical indiscipline of Cabaye but also because of the lack of technical quality in the Newcastle midfield. Perch and Tiote in deep were up against Lucas and Steven Gerrard who both possess a much more dynamic passing game. Perch for example, completed only 13 forward passes all game compared to Lucas’ 43. The Liverpool roles are quite clearly defined, Lucas is the possession recycler, retrieving and moving it simply, which allows Gerrard to play more expansive passes to make most use of his superior range. This meant Liverpool had a multidimensional attack and they could play their passing football much nearer to the Newcastle goal. The inability of Newcastle’s midfield to move the ball in a significant way meant they had to resort to longer aimless balls and they hardly posed any threat. This Villa thrashing came completely out of the blue but Paul Lambert won it by tactically out duelling Paolo Di Canio. Villa focused their ground based passing down the Sunderland left and their aerial attack down the Sunderland right, with both moves designed to exploit Sunderland’s weaknesses. The Sunderland left was manned by left back Danny Rose with Seb Larsson on the left of the midfield. Rose is a converted left winger who is still learning the defensive side of his position and Larsson was playing out of position. He is usually on the right or central and despite being put on the left he spent a lot of time wondering centrally. This meant that the inexperienced Rose spent a lot of time exposed to the rampaging right back Matt Lowton, Momo Sylla drifting right from his central position and Andi Weimann who kept discipline and width on the right of the three man attack. Everything came down the Villa right and Sunderland couldn’t cope. Villa play maker Ashley Westwood’s pass direction is indicative of this tactical plan to attack the weak Sunderland left as most of his passes were sent that way. The second part of the Villa staretgy was to attack Sunderland in the air on the right. Right back Phil Bardsley and winger Adam Johnson were identified as aerial weaknesses and duly attacked. Villa keeper Brad Guzan almost exclusively kicked the ball long and left to target Christian Benteke. Benteke was fouled 5 times and won 5 headers in aerial battles on the left. Villa kept this strategy up and it allowed them a second dimension to their patient passing on the right. 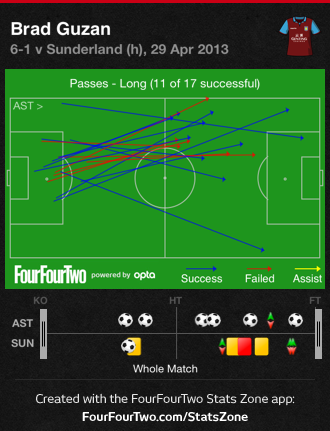 It stretched Sunderland wide open and led to the rout.